Our last day in studio began with Walter recording the vocals. As always he did his job very well, and, apart from a very few small harmless discussions between him and me (due to the fact that I am obsessively picky regarding the vocals on Morito Ergo Sum), everything went smoothly and fast. 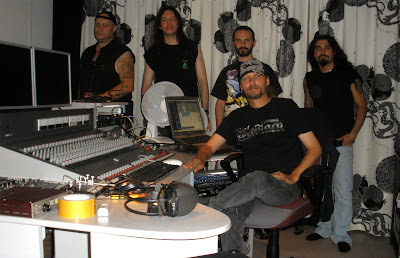 Walter Basile during the recordings of the vocals. Right after the vocals were done Pablo began to do his work. Differently from Morito Ergo Sum's first demo, that contains no guitar solos, this time all the 4 new songs have solos, and I must say all of them sounds pretty freaking amazing! Being such a good guitarist, Pablo's recordings also went faster than we expected. He even managed to come with some great new ideas on the spot, and added a few impressive improvisations! We finished the day drinking some beers with Mike Wead while listening to the results of these 4 days of hard but fun work in the A.R.T. Studios. Now all is left to do is to record the violins, but this will be done probably at Walter's home next week. We are all extremely happy and proud with the results. Personally, the final sound of the songs are exactly as I have imagined in my mind, and I cannot thank Mike enough for his great job!